A vegetable, which belongs to the lily family of plants, that is grown for its edible bulb, which most often serves to flavor a variety of foods. Onions are categorized as being either green or dry onions. Green onions, known as scallions, are harvested before they mature, while their stems are still green. The bulb is generally white-skinned with a flavor that ranges from mild to peppery and pungent. Common varieties that are eaten raw or are used to flavor soups and salads include white Lisbon and Ishikura. Dry onions, also known as mature onions, are harvested when their shoot has died and layers of papery thin skin cover a firm juicy flesh. There are a wide variety of shapes and sizes, ranging from small round pearl onions to the larger spherical-shaped Spanish onions. The dry onions can be classified as either sweet or storage onions and are most often sold as a red, yellow or white onion. Sweet onions, which contain a higher water content but a lower sulfur content, spoil quickly and are less pungent than other varieties. They are most often eaten raw or only lightly cooked. Common varieties of sweet onions include: Arizona onion, Carzalia sweet, Florida Sweet, Granex, Maui, sweet Imperial, Oso sweet, Texas spring sweets, Spring onions, Vidalias, Walla Wallas, and Texas 1015's. Storage onions contain a higher sulfur content and less moisture, so they can be kept in storage for longer periods of time, developing a more pungent flavor as they age. The storage onion is best when cooked, providing a sharper and more flavorful taste than sweet onions. 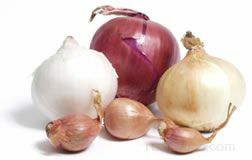 Some of the more common varieties of dry onions will include the Bermuda red, Cipolline or Borettana white, Creole Red, Fall onion, Spanish yellow, Italian red, Pearl white, Red Torpedo, white onion and yellow onion. When selecting onions, choose those that have unblemished bulbs with thin skins and crisp leaves. Avoid any that are sprouting. Onions, which are available throughout the year, should be stored in a cool dry location and may be stored uncut for a month or longer. When preparing onions, slice or chop by starting at the end opposite the root. Onions contain gases that cause our eyes to tear, and since more gases reside in the root end, chop or slice it last. It is generally considered best to slice onions with the grain, often refered to pole to pole or in the direction of end to end. To cut an onion with the grain, start by slicing off both ends, creating a round flat spot on each end. Set the onion down resting on the flat spot of either end, and vertically cut the onion in half from top to bottom, resulting in two pieces split in half. Now place one half down on the flat side of the most recent cut, which is the center of the onion. The onion can then be cut straight down vertically, end to end making even spaced cuts that are made with the grain. Cutting onions in this manner provides a more pleasing presentation for with foods containing braised, cooked or fresh onions. In addition, slices are cut with the grain will hold up better during lengthy cooking such as with meat roasts. When an Onion is cut across the grain the slices will quickly lose their shape and decrease in size. However, the slices and pieces can still be used best for toppings and small pieces to be added to other foods. Other ways to decrease tears when peeling or cutting onions are by chilling onions prior to slicing or running cold water over the onion while slicing. To remove the pungent odor remaining on any flesh coming in contact with an onion, use stainless steel products produced specifically for removing onion aroma or any stainless steel item that can be rubbed through or across the exposed flesh as it is washed.